In August of 2012, after years of working in finance, Bill Davis officially retired. He resides in Mendham, New Jersey and has raised seven children. Since he was now retired, he was looking forward to staying home more and watch his seven grandchildren grow up. However, it would not be all sunshine and rainbows for the Davis family. For the first year or so after retiring, there was a difference in Bill. His children saw a personality change in him. “He seemed much more irritable and depressed and not like the dad we all grew up with,” said Meagan Davis, Bill’s 22 year old daughter. This included several mood swings. His family were convinced that he needed to see a psychologist and work through depressive symptoms as this might be a result of not working. However, this was not the case. In 2014, Bill Davis was diagnosed with Huntington’s disease (HD). This is a fatal genetic disorder that causes the progressive breakdown of nerve cells in the brain. It deteriorates a person’s physical and mental abilities during their prime working years and has no cure. The news would come as a shock to the family as there was no prior knowledge of the disease in his family. The disease can be described as having ALS, Parkinson’s and Alzheimer’s – simultaneously. The symptoms of the disease progresses slowly over the course of about 15 years. The disease can affect one’s ability to reason, walk, and speak. Other symptoms include personality changes, mood swings, forgetfulness, slurred speech, difficult swallowing, and significant weight loss. After speaking to HDSA, Meagan would learn about the HD Parity Act. This is a bipartisan bill that ensures Medicare is made available to people with Huntington’s disease (HD) immediately upon qualification for disability. 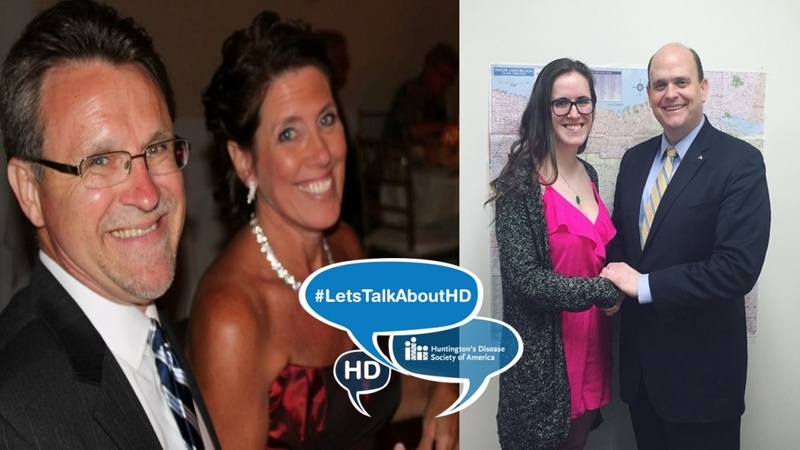 Meagan has advocated alongside HDSA to have the bill passed as this would help families affected with HD. As for Meagan’s family, Bill’s children have all processed the news in different ways as they know this disease does not only affect them but their children as well. Each child of a parent with HD has a 50/50 chance of inheriting the faulty gene that causes Huntington’s disease. Bill would not give up and wanted to fight for not only his future but his children and grandchildren as well. He has an entire community that supports each other and has rallied to bring more awareness to the fatal disease. Bill has continued to advocate passionately to raise awareness and is encouraging people to donate to HDSA. He believes that one day we will find a cure and has a message for the HD Community.